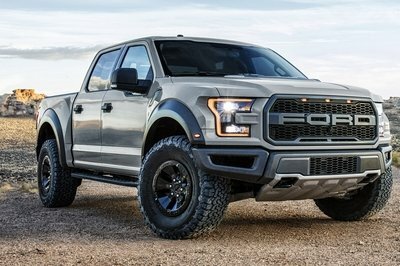 In the latest years the pickup trucks have started to migrate from the muddy working sites directly on the sunny beaches or in the middle of extravagant exotic resorts. However, leaving apart that special category of people who started to consider pickups and SUVs only another piece of their stylish wardrobe, the true purpose of these vehicle wasn’t forgotten and some of them continue to be capable work horses ready to go head to head with whatever you’ll thrown at them. In the world of pickups, there was one model that was able to always stand out from the crowd. This model is called the Hilux and even since its inception has managed to occupy a top position being considered one of the most reliable vehicle in its class. 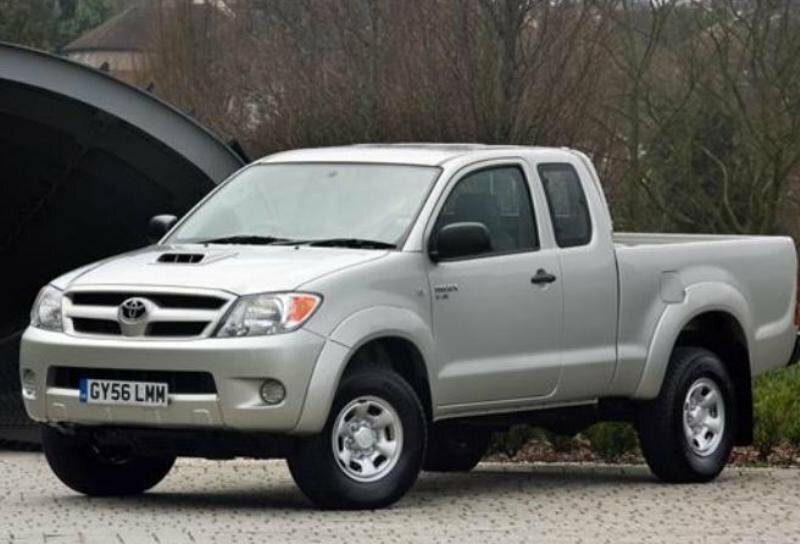 The seventh generation Hilux was sold between 2005 and 2009 and was available in single, extended and crew cab configurations. The vehicle had a starting price of $22700 and was offered with 120 hp and 171 hp diesel engines. When looking at the Hilux, the first things that strike you are the imposing stance and the huge exterior dimensions. The vehicle has also a very tall ground clearance which helps it deal with difficult terrains without too much drama. Up front, there is a trapezoid radiator grille with a horizontal bar which reflected the rugged nature of the vehicle. The bumper has a large, wide opening and features two circular fog lamps being a perfect match for the rest of the body. The vehicle features strong, muscular lines which sweep through to the rear. 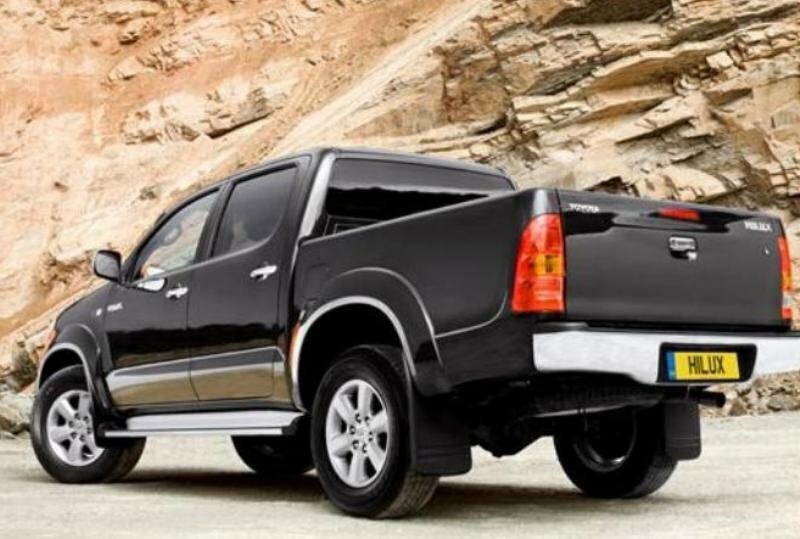 We also like the oversized wheel arches which further enhance the aggressive stance of the Hilux. The load bed if fairly big and permits you to carry loads heavier than 1000 kg. The deck length on the single cab model is 2315 mm (with 1520 mm width) while on the double cab version is 1520 mm (1515 mm width). The interior design is appropriately utilitarian. The materials look pretty good but they were selected for their durability over luxury. Hence, most of them are part of the hard class and the driver is surrounded by inhospitable touchpoints. 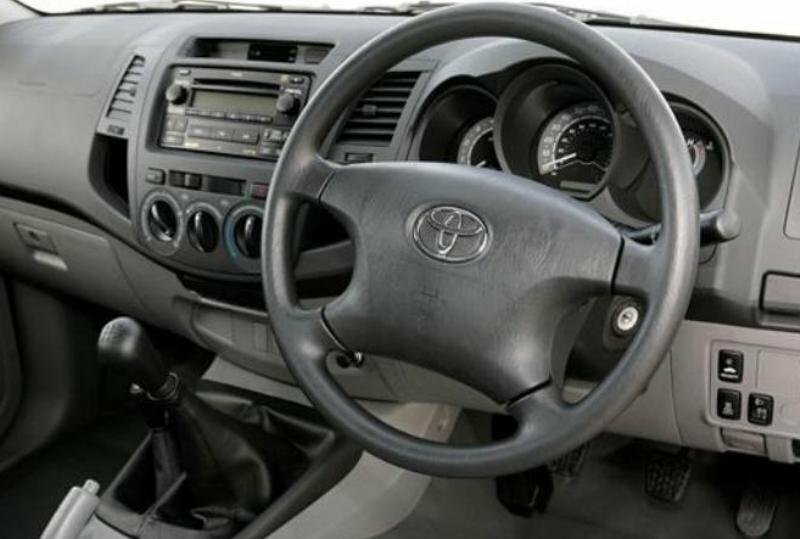 Overall the interior design is an area where the Hilux is looking and feeling its age. Luckily, the controls are straight-forward and ergonomically friendly. The build quality is also very good and everything inside seems well put together. You are also treated with a royal amount of space and up front there is enough leg- and head-room for both the driver and passenger. The seats are big and comfortable and there are also plenty adjustments to keep you happy. The driver is met by an ergonomic four spoke steering wheel that offers a good grab. The instrument cluster looks fairly sporty while the indicators are logically assembled and provide information on fuel consumption, speed, rpms and other vehicle stats. Meanwhile, the dash is laid in well-grained, dual-tone plastic. The center stack offers two cubbies sized for a mobile phone or other portable device. The Crew Cab ads an impressive amount of space for the rear passengers were there’s easily enough leg, head and hip room for three people. Moreover, the rear bench stows quickly with the lift of two under-seat paddles to provide extra cargo space. At the launch, the Hilux was offered with a 101 hp 2.5 liter engine with a peak torque of 260 Nm. This unit wasn’t as lively as other engines in the segment and the acceleration felt rather sluggish than punchy. At least it was fairly smooth permitting you to cruise all day long without feeling the need to cover your ears. The power problem was solved with a small tweak which raised the 2.5 diesel’s power up to 120 hp and the addition of a bigger 3.0 liter unit which came with 170 hp on tap. These units were clearly a big evolution in terms of power and torque, but the Hilux was still a half step behind of its rivals. At least, both diesels were pretty efficient and didn’t break the bank when it came to fuel consumption. For instance the 2.5 liter engine scored an average fuel consumption of 38 mpg for the 2WD models and 34 mpg for the 4WD versions. TheToyota Hilux sits on a firm yet compliant chassis, with front double wishbones and rear leaf spring suspension. 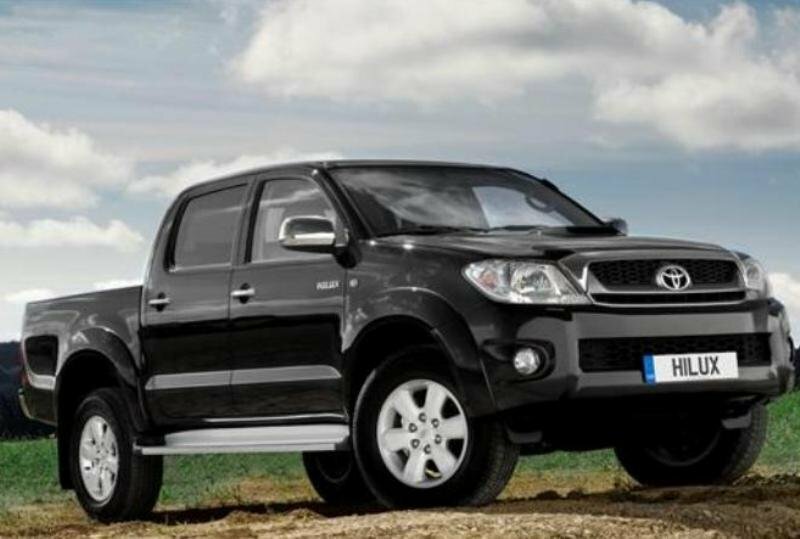 Both the ride and stability are faultless and help you drive the Hilux without any problems. Steering is solid and it’s combined with an elevated height making the Hilux drive like a true pickup truck. The capable suspension setup helps to eliminate much of the body roll that it’s usually common for this type of vehicles. Though, the biggest bumps still make their way into the cab, but this is largely an unavoidable issue in a truck that was designed mostly for utilitarian purposes. The good news is that if you get too frisky with the go pedal, the brakes will do a great job of bringing things under control. Toyota built the seventh generation Hilux with front ventilated discs and rear drums complete with standard ABS. Twin airbags were also part of the standard equipment across the range and the front seatbelts were fitted with pretensioners. 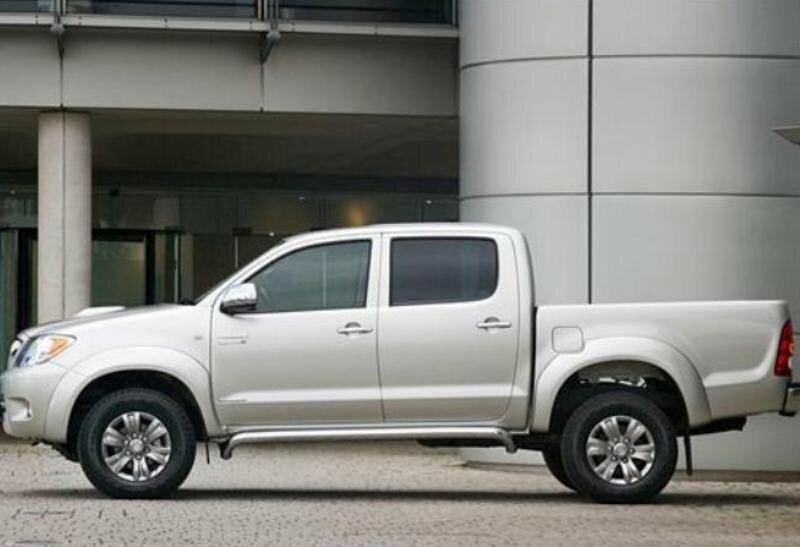 Ina world were pickup trucks have started to lose their masculinity in favor of silky smooth rides, attractive curved lines and luxurious interiors, the Hilux continues to keep its testosterone level up and has boosts a tough character perfectly suited for arduous working conditions. Despite its utilitarian nature, the interior wasn’t left behind by Toyota’s engineers and the ergonomy is nothing short of excellent with massive, supportive seats and a solid build quality. The updated engines were also up to the task and offered decent performances along with an adequate efficiency. The seventh generation Toyota Hilux was also a pretty capable off roader and the handling abilities were among the best in its segment. Overall the Toyota Hilux represents an attractive package and its famous Japanese reliability it’s also worth to be taken into consideration.